Online marketing is an efficient way of promoting your business, but there are still channels that are not exploited to their full potential. There are many tools, techniques and social networks you can use to increase the scope and reach of your product or services online. Unlike traditional marketing, content for online marketing is sustainable. If you want to take your online campaign to another level, you should think outside of the box and integrate cross-promotion into your online marketing strategies. Cross-promotion is a technique whereby you utilize another medium or channel to promote or distribute your services and products to new markets. It is a powerful and inexpensive approach to generate more sales and expand your marketing efforts. In simple words, you find a partner that sells a complementary product for your company, and you cross-promote each other. By doing cross-promotion with a partner, you can tap into an already established community and potentially get more qualified leads. Done properly, it can build your brand by creating a strategic partnership or alliance with another business. Popular businesses use cross-promotion all over the world. The most famous example of cross-promotion is the partnership between Google’s Android and KitKat. Over 50 million KitKat chocolate bars were created with Android’s branding, and the buyers had a chance to win a Nexus Tablet or Google Play gift cards. 1. Partner with a non-competing brand. Before crafting your posts, you and your partner should discuss the nature of the content -- its tone and description so that it would be relevant to the respective market. As a non-competing business, you should always establish relevance for the market to consider your product or service. An example worth mentioning is the cross-promotional partnership arrangement between Macy’s and Special Books by Special Kids, a non-profit organization. 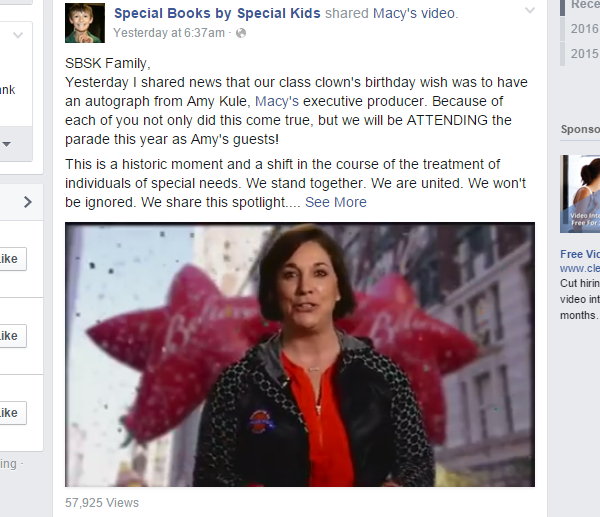 Macy’s mentioned Special Books by Special Kids on their Facebook page which was then cross shared on their partner’s Facebook page. 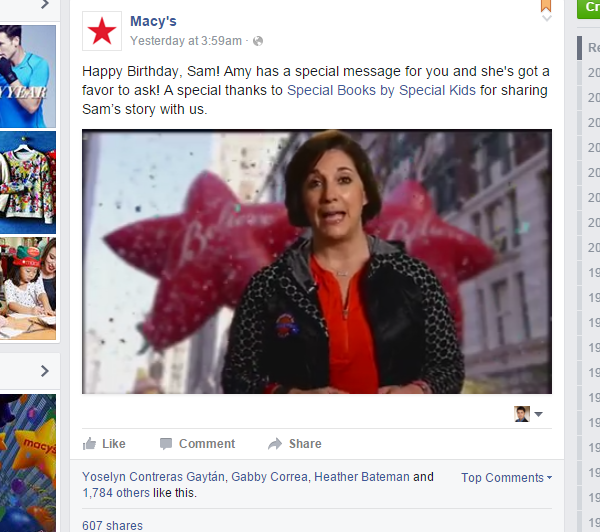 Instead of creating a new post, the non-profit organization merely shared Macy’s FB post to stay consistent with their online marketing campaign. It introduced their group to Macy’s followers and created a strong brand affiliation. 2. Online businesses that want to cross-promote via newsletter. Cross-promotion is popular among mobile applications. Various tools can automate the promotion process, but if you work in a SaaS or own a general online business, you don’t have to give up on this technique. The opportunities are even greater if you are in the business to business market. Reach out to companies that are not direct competitors and ask if they might be interested in a partnership. You can cross-promote each other’s services through newsletter campaigns. Before reaching out, always do your research and make sure that you agree to associate your company’s name with theirs. Use tools like Cross.Promo which promises to help SaaS and online business find and manage cross-promotion campaigns. The platform gives users the flexibility to segment partners based on the number of users they have and how many of them are actively paying for a service. 3. Social media posts cross-promotion. Social media is a powerful online marketing tool that has been proven to influence consumer decision-making. Statistics have shown that 46 percent of consumers’ decision to patronize or purchase a product or service was influenced by a social media post. Include social tabs to your Facebook page. Facebook allows you to use third-party apps to add social tabs to your page. Among these third-party apps are ShortStack and PageModo. Social tabs allow your page visitors access to your other social networks and view your content. Integrate social media with email marketing. To further enhance the power of social media, integrate it with your email marketing strategy. Email is highly effective because everyone opens their inbox at least once a day. Promote your latest social media post to your usual email newsletter. Not only will email marketing increase the number of page views, but it can potentially improve overall engagement. Use your website or blog page. If you are using WordPress for your site or blog page, a plug-in such as Publicize will automatically send your website content to your social media network. You can also embed your latest social media posts on the sidebar of your website. It’s a cost effective and highly efficient way to improve inbound traffic to your website. CoPromote is a useful tool for cross-promotion on social media. Content marketing is becoming an increasingly popular online marketing strategy. That’s because content marketing reflects the online behavior of the majority of the internet’s searchers. People go online to search for content that is relevant, fresh, engaging and compelling. Cross-promoting your content marketing is an excellent way to expand its reach to new markets. Add links inside your content. Link building is a perfect strategy for introducing new markets to your content. If you link to websites, they may return the favor and link back to you or share your post on social media. This is why it is highly important to ensure the links are relevant to your content. After linking back to a site, make sure to do email outreach and inform the editors that you placed a link to their site. Update existing links. Information changes at an unpredictable scale. Make sure the links to your content are regularly updated to reflect current information. Blog in other communities. Guest blogging in related communities is a great way to introduce your content and you, specifically, to new markets and audiences. Not only will guest blogging bring more views to your site, but it may encourage some of the new audience to share your content on their respective networks. Pinterest is not as big as Facebook or Google Plus, but it is great as a cross-promotional tool for online marketing content. Create a customized board. Pin images that tell the story of the product, then pin images from your blog, website, Facebook or a landing page. The pins will create a link back to the original content. Create a group board. If you have a loyal following whom you believe wants to promote your products and services, invite them to become part of your group board. They can pin content directly to your board which can be seen by their respective followers. By creating a group board, you improve the visibility of your page and produce customized content for a varied audience. Cross-promotion is a smart technique that allows you to tap into already established communities and expand your reach. By integrating cross-promotion with your online marketing channels, you’ll have the opportunity to advertise your product in front of new potential users without spending a big budget. It’s a dynamic approach that makes online marketing more efficient and productive in building your brand.